Shreshth Khanna always had the knack for cooking & dream to start something of his own. 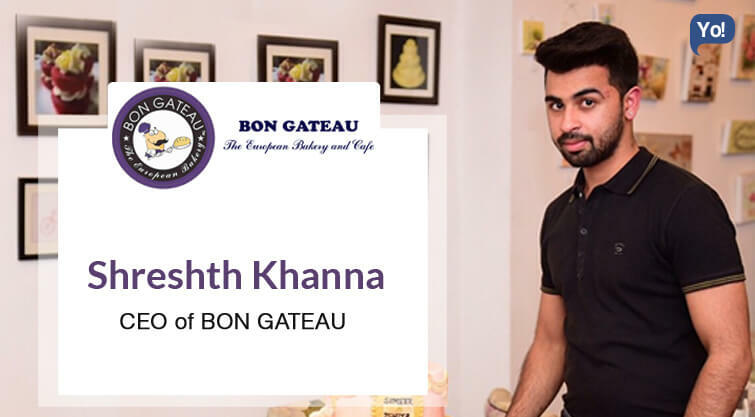 After completing his diploma in Patesserie from International Institute of Culinary Arts (IICA), New Delhi, he finally made his dream come true by opening Bon Gateau Bakery in Amritsar with the help of his father. Today, Shreshth Khanna has expanded his venture into a café and desert catering, and claims to have reached almost 90% of the local market. For his accomplishment, he has also been awarded as a Star Chef & Entrepreneur with Outstanding Alumni Award by IICA, New Delhi. In 2016, Shreshth is looking forward to open his bakery’s franchise in Chandigarh and other major cities in Punjab. BON GATEAU (THE EUROPEAN BAKERY) the word itself means good cakes. AMRITSAR did not have any good bakeries. So i had that first mover advantage of it. Our products are totally different from other bakeries,since its a french bakery. We are overpriced because of the quality of our products.We are wholesalers to 90 percent of the restro of their bakery needs. My dad was the biggest inspiration to me. Secondly Amritsar dint have any good bakeries, this was first of its kind .It has always been my dream to do something of my own and make my Own name . My training period which was about 4 months in The Imperial Hotel, New Delhi. I have learned a lot in those 4 months . My dad had invested 20 lacs to start off . i repaid the amount within a year and further expanded on my own .we have the biggest machinery related to bakery in Amritsar which can cater to any number of orders in a day . later i invested another 15 lacs to turn that bakery into cafe .It turned out to be another success. My workers are highly paid . i try to help them in their money needs and extra perks are given to them according to their service. 1) My customer is everything to me .I feel if we don’t take care of our customers someone else will. 2) Work hard as much as u can until u achieve what you want to. Facebook, Instagram, Google, Justdial, Zomato. Work hard and think about future plans and achieve them. Making a right choice by selecting good staff. A lot of people have been asking for franchise in their city .our new project is already in the pipeline expecting it to open by March. It’s gonna be the biggest cafe in Amritsar. Chandigarh, Ludhiana, Delhi would be my next investment. I would like to improve my mistakes .